G-Series based on Glassware 2.0 is the first in our Microsoft Windows based product line. We built G-Series to deliver Windows desktop applications to any device, but more efficiently and cost effectively than other virtual or physical solutions. You can purchase G-Series based on Glassware 2.0 appliances to use locally on premise or you can spin up a G-Series cloud instance on the Microsoft Azure platform. You can use your Windows desktop apps at blazing fast speeds with up to a 75% savings in Total Cost of Ownership and with only the knowledge required to manage the physical Windows PC you have on your desk right now. Glassware 2.0 Containers take a Windows App and containerize it with only the OS components needed to run. The image on the right shows the processing power used by an App when running on Windows. By Containerizing the App, Glassware 2.0 removes much of the Windows OS processing needed to run on a physical or virtual desktop. As a side benefit, removing complexities related to the OS allows Windows Apps that do not virtualize well to virtualize on Glassware 2.0. The Glassware 2.0 Microvisor then allows the Windows Apps to share ONE set of OS components. Which leads to tremendous efficiencies and Total Cost of Ownership savings. Glassware 2.0 Manager Makes it Easy to Use. We’ve made it very easy to containerize applications. It takes less than 30 minutes to provision a G-Series based on Glassware 2.0 appliance, or a G-Series Azure instance in the cloud. After provisioning, it takes less than 30 minutes to containerize an application. It simply requires someone who knows how to manage a desktop to install an .exe or .msi file. Compare that one hour process to days with our virtualization competitors who use app packaging and other complex techniques to virtualize apps. 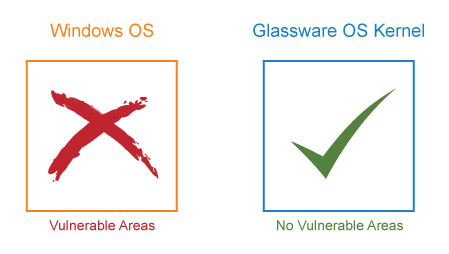 Glassware 2.0 has a much smaller OS footprint than a full desktop. Many of the attack areas targeted by viruses simply do not exist, rendering the viruses powerless. We’ve created an RDP client technology that is a projection of pixels and pixel changes. 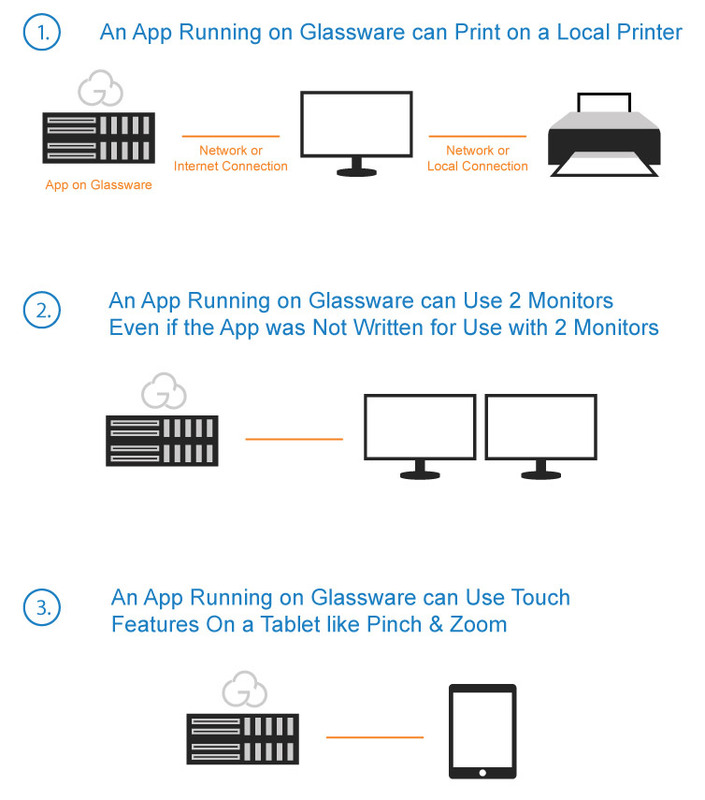 There is no other data moving back and forth from the Glassware 2.0 server to your device. That means no security issues for your device and no need to use Enterprise Mobile Management software to manage security for your device. Download iOs, Android, Chromebook here. Or use a Java based client on Windows and Mac. Or use a HTML5 based client. Please note that Glassware 2.0 can always be used as a drop-in appliance with no need to change or rip ‘n replace your current infrastructure. 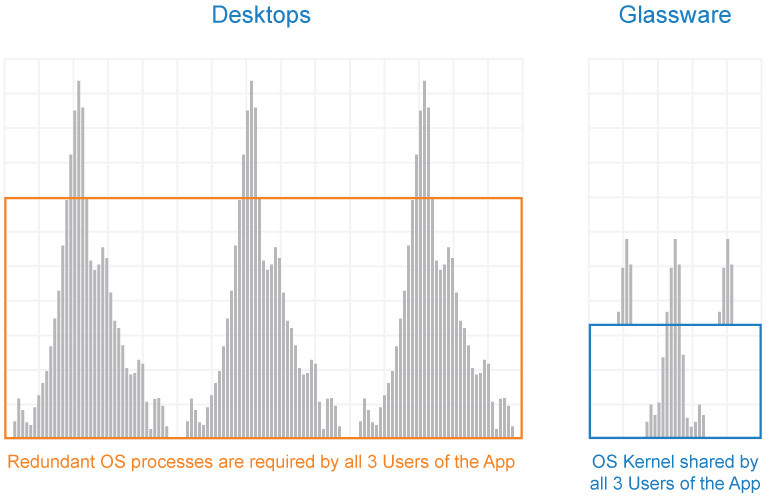 New and Existing Deployments Reduce Cost of Running Apps. 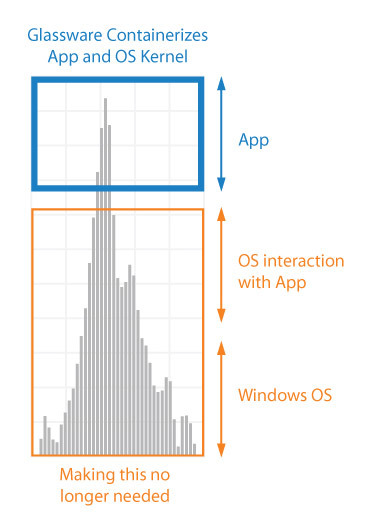 Reduce cost of new physical or virtual desktops by off-loading resource and\or GPU intensive Windows Apps to Glassware 2.0. Extend Life of Current Hardware. Extend life of existing deployment by off-loading new resource or GPU intensive Windows apps to Glassware 2.0. Reduce Peak or Power Users. 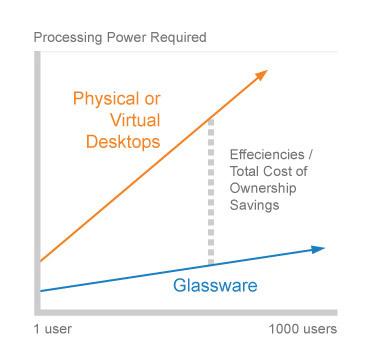 Reduce peak usage or the effect of power users by off-loading processing power to Glassware 2.0. Upgrade OS & Keep Legacy Apps. Upgrade to newest Windows OS while keeping mission critical legacy Windows Apps (no need to keep an old OS because of old apps). Migrate to Virtual. Make a migration to virtual economic by using Glassware 2.0 to virtualize unvirtualizable apps and\or reduce cost of virtual deployment.